ROE units including electrical preheater and control cabinet. These units can be used to provide heating power to any industrial application where oil or a similar fluid is to be heated. 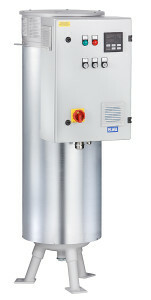 The ROE series is available with heating power from 3 to 300 kW. The heater and control cabinet are integrated and perfectly adapted for the application. The ROE units are used to preheat lubrication oil or fuel oil for separation in centrifuges.